Many people are trying to obtain a mortgage with a low credit score. But what low credit score actually means? Those who have experienced some negative credit activity in their recent past or are having some trouble keeping up with monthly credit obligations, they may soon discover their credit scores have suffered. Or, other times they might think their credit is doing okay but after they apply for a home loan they don’t get the result they wanted and their application, unfortunately, is turned down. What affects credit scores the most? Mortgage companies today use the algorithm designed by The FICO Company. The FICO scores were originally introduced in the late 1990s and while lenders referred to these three-digit numbers they didn’t require a minimum credit score. Instead, the lender reviewed the credit report line item by line item. Later, credit score minimums did start to take effect. Today, most every loan program available does require some minimum credit score. 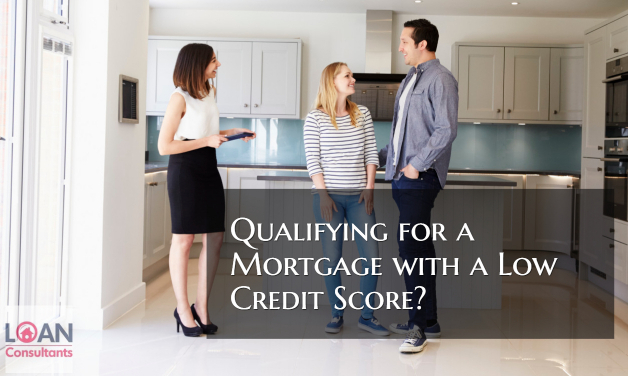 These minimum scores can vary based upon the loan program and can even be different on the very same program. For example, the Federal Housing Administration sets the guidelines for FHA loans. Conventional loans also have minimum credit score requirements. There are five primary factors that impact a credit score. These scores, ranging from 300 to 850, are shaped by an individual’s payment history, how much someone owes on a credit line, the types of credit used, how long someone has used credit and how many times an individual has requested new credit over the past couple of years. The two most important categories are payment history and account balances. When someone makes a payment on a credit account more than 30 days past the due date, credit scores will start to fall. People struggling with obtaining a mortgage with a Low credit score. Payment histories account for 35% of the total score and carry the most weight when scores are calculated. If someone makes a payment more than 60 days past the due date, scores fall further and more quickly. Conversely, when individuals make their payments on time or at least before 30 days has past scores will gradually increase over time. It’s important to note here that it takes a while for scores to rise but doesn’t take very long to fall when negative activity is recorded. As it relates to account balances, the ideal balance-to-limit ratio is around 33%. This means an account balance of $3,300 on a $10,000 credit line will cause scores to improve. Yet as a balance approaches the credit limit, scores will begin to falter and significantly drop if a balance exceeds, even temporarily, the credit line. This category contributes 30% to the total score. If someone concentrates on these two categories alone, scores will increase. On the other hand, if these two categories show some negative activity, scores will be harmed. So what can someone do when their credit scores are low and they want to buy and finance a home in today’s marketplace? Fortunately, lending guidelines and lenders alike have relaxed somewhat compared to the period immediately following the 2008-2009 mortgage debacle. For a time, it seemed the only applicants who could qualify for a home loan were the ones who didn’t need or want one. Today that has changed and the answer for many lies with an FHA mortgage. FHA doesn’t approve loans but FHA approved lenders do. Lenders accept an application to buy and finance a home and by following the FHA requirements, the loan is eligible for sale in the secondary market and also comes with an inherent loan guarantee. Should the loan ever go into default the lender is compensated for the loss. This compensation is financed by two separate mortgage insurance premiums, an upfront premium that is rolled into the loan amount and an annual premium paid in monthly installments. One of the guidelines that FHA requires for the mortgage with a low credit score for 2018 is having FICO no lower than 500. The minimum credit score for those coming to the closing table with the minimum down payment of 3.5% of the sales, price, the minimum score is raised to 580. However, lenders typically won’t approve a loan with a FICO score of 500. A 500 score indicates there are some credit issues that still need to be resolved. Most lenders today ask for a minimum credit score to be in the 620-640 range before credit can be approved. If someone with a credit score of 620 applies for an FHA loan and makes a 3.5% down payment, the loan is eligible for an approval. With a conventional loan and a 5.0% down payment, a lender could consider the approval but the interest rate could be adjusted higher by as much as a full percentage point, making it more difficult to qualify for a mortgage with a low credit score. The remaining government-backed home loans are those that are underwritten to VA an USDA standards. Those that are eligible for a VA loan include veterans, active duty personnel, Reservists and National Guard members with at least six years of service and un-remarried spouses of those who died while serving or as a result of a service-related injury. Most lenders will approve a VA or USDA loan with a minimum credit score of 640, although exceptions can be made. In today’s mortgage marketplace, lenders are more likely to approve a mortgage with a low credit score than they were just a few years ago. As lending guidelines have stabilized and foreclosures and default rates have receded, more loans with lower credit scores are being approved. This is especially important for someone who applied for a loan just a year or two ago and was told they couldn’t qualify based upon their credit scores. Many could have simply given up thinking they could never qualify. But even if those very same individuals had the very same scores today that they did say a couple of years ago, because of recent changes in underwriting guidelines they might very well be approved for an FHA loan. The important thing to do is to take the first step and speak with a lender who can provide the latest updates on available loan programs in today’s marketplace.